Adding raw vegetables to your meal has always been recommended by nutritionists. The best way to add fresh fruits and vegetables to your daily diet chart is through salads. If you are planning to lose weight, then fresh salads are the best option. Raw vegetables and fruits not only add vitamins and minerals to your diet, but also make you feel full for longer. Using a sharp knife, cut the tops from the carrots and peel them. Cut the peeled and washed carrots lengthwise, just like matchsticks. Using the same sharp knife, cut away the broccoli florets from the stem. Cut the broccoli florets into sizes of your choice, but it is better to stick to bite size pieces. Peel off the broccoli stem and cut it lengthwise, like you earlier cut the carrots. In a small mixing bowl, take one tablespoon of Dijon mustard, two tablespoons of honey, two tablespoons of extra-virgin olive oil and one tablespoon of apple cider vinegar. Mix them well using a spoon or fork. Add a pinch of kosher salt and ½ teaspoon of freshly ground black pepper to it. Again mix it well until emulsified. Taste the dressing and adjust the seasonings according to your need and preference. 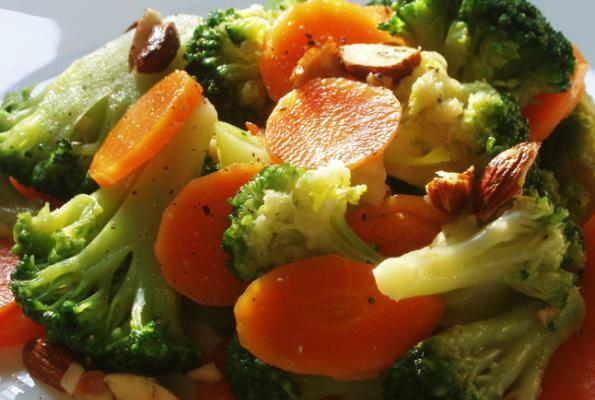 In a large salad bowl, put the cut carrots and broccoli and ¼ cup raw sunflower seeds. Add the honey mustard vinaigrette to it, and toss to combine.